10 DAYS UNTIL I GO TO JAPAN! (But who’s counting?) | I think in comics. My freshman year is over. It was chaotic. It was stressful. It was a crazy new experience. I got to go to so many places, learn so many things, and meet all sorts of awesome people. Moving out and saying goodbye to the friends I had made this year was a bittersweet experience. Sure, we’d be back in a couple of months– but our freshman year is a time we’ll never get back. I’ve wanted to go to Japan, then, for a very long time. But it had always seemed like a distant dream. One of those things you obtain in ten years or so, after you have a stable job, save up some money, and are able to take off a week or two for vacation. But then, in my junior year of high school, two friends of mine achieved the dream. They had won a scholarship through Youth for Understanding, an organization that sets up study abroad programs for high school students. For six weeks, they would go abroad and live with a host family for six weeks. And they were going. To Japan. I was pretty jealous. I was sufficiently inspired to apply for the same program the year after. Somehow I managed to win one of five full-tuition Mazda/Nationwide Community Scholarships. But as we all know, last summer, Japan went through the horrible tragedy of the earthquake and tsunami and the Fukushima-Daiichi nuclear disaster. Therefore, I was shipped off to Germany instead. I wouldn’t trade my experience in Germany for anything. Germany is das schönste Land an der Welt, and I was lucky enough to get the greatest host family in the world. But still, in the back of my mind, I wanted to go to Japan. The other nine kids on the same scholarship felt the same way, as I discovered when we visited the Mazda Europe Research and Development headquarters. Here, in addition to showing us how concept cars are designed (it’s pretty awesome) they also taught us a little bit about Japanese culture. A daruma, for those who don’t know, is this sort of symbolic Japanese traditional doll seen as a symbol of good luck and hard work. Upon receiving a daruma, you paint in one eye and set a goal. You then place the daruma in a place where you can see it every day, reminding you of your goal. When your goal is finally achieved, you paint in the other eye. So this little daruma has been sitting on my desk all year, reminding me of my goal. I thus applied for Northeastern’s Dialogue of Civilizations program to Japan, and by some miracle, was accepted. And I am ecstatic. Amazed. Stunned. And extremely, extremely excited. 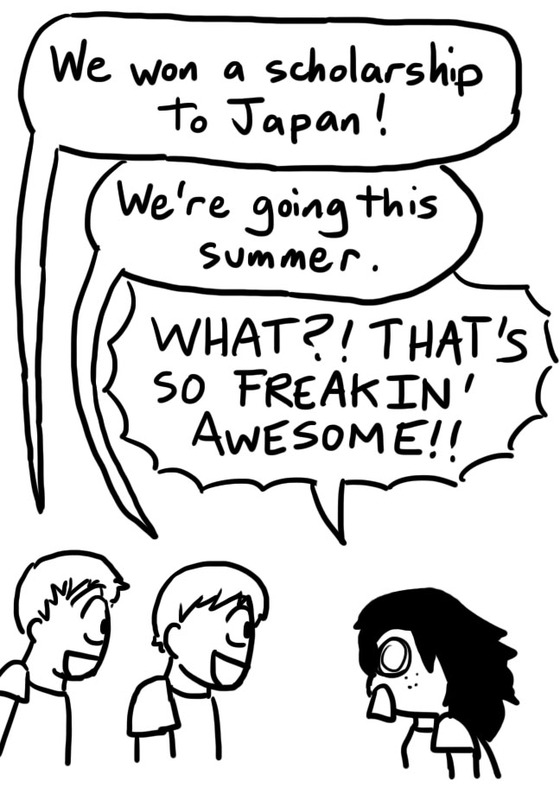 So, in 10 days, I’ll be headed off to Japan. Awww, Vy! First off all, lovely sunrise photos. Second of all, I am so freaking excited for you to go to Japan! I can’t wait to see the comics you come up with there. I’m freaking excited too! And (as dorky as it is) I can’t wait to blog about it as well!! We’re going to be suuuuper busy (every day is literally packed) and internet access is spotty, but I WILL FIND A WAY! AHHH I CAN’T WAIT! Internal dialogues are the best. What can I say? Congratulations Vy! I’m very very very happy for you! Where specifically in Japan are you going? I might be able to give you some good places to go! Thank you! My group is going to spend 10 days in Tokyo, 4 days in Kyoto, and 23 days in Sapporo. We have class in the morning, a field trip in the afternoon, and evenings are basically free. Have you been to Japan before? I’d love to know the best places to go! Well my girlfriend grew up in Tokyo so she knows all of the hot spots. She says that if you really want to Tokyo, you should really experience the culture. Here’s a *ahem* “short list” of things. Real karaoke. Odaiba gundam. プリクラ. As many ramen shops as humanly possible. A soba shop. If you want a good view of Tokyo with good photo ops go to Tochou – it’s a tall government building with free rides to the tip-top, and unlike Tokyo tower, it’s free and it’s taller. Harajuku, Akihabara, Omotesando, Yoyogi are musts (everywhere surrounding Shibuya is a must). Ikebukuro. Shinjuku. Kabukichou. Tsukiji (the fish market of Tokyo – if you can stand the smell of fish). Donkihote is a good store for the cheap souvenirs that everybody has asked you to buy. Go see a Japanese movie. Japanese arcades also a must (shinjuku, shibuya, or akihabara have the best ones). If you are at least 20 – go bar hopping. You won’t regret it. This should get you started with stuff to do. If you need any clarifications or have any specific questions let me know. Kyoto will have more of those “pretty Japan touristy things” and I can’t really help you with Kyoto or Sapporo. Have you been to Japan before, out of curiosity? You seem to know quite a lot! You’re going to the Ghibli Museum!? *jealous*. My girlfriend used to live near the Ghibli Museum, she still has her ticket which is a framed snippet of film from “Spirited Away”. It’s awesome lol. 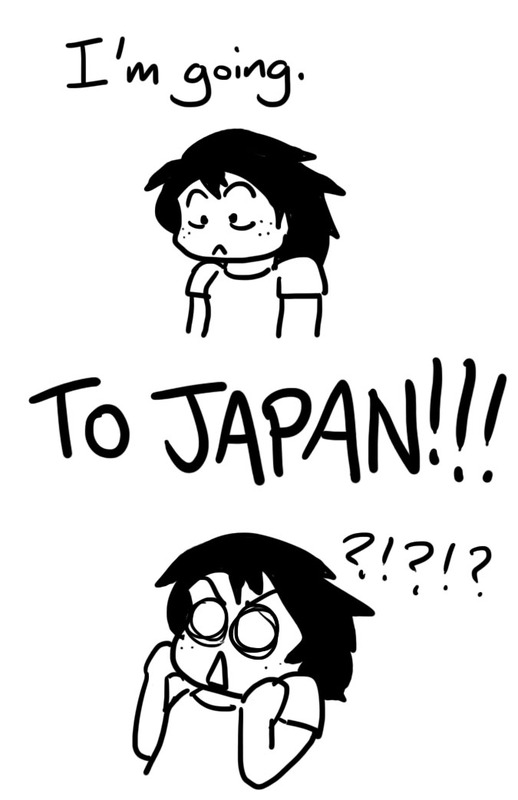 I have actually never been IN Japan, but I know so much about it because of how much time I spend in Japan in my head. I was going to go this summer but ticket prices shot up :/. Ticket prices are a problem. They’re, what, around $2,000 round trip? It’s expensive for sure. It’s for that same reason I’ve never been to Vietnam, despite being Vietnamese– tickets are just so goshdarn pricey. ❤ ❤ You have a daruma? That's so cool. If I had one, it'd be there uncompleted for longer than a year though, and it'd drive me crazy. Who knows? Maybe it'd motivate me more. I felt particularly bad for you missing out on the Tanabata Festival. I also know how you feel about it not feeling real; before I went to America, I never thought it'd happen. You see, mum always talks about it, and we have far more family there than here in Australia. Then we went and I met the family for the first time last year. When I went to America, I went to Oregon (but we got to stop off at Hawaii along the way!) and we also visited family in Missouri. We also went to visit my Uncle Tegger in another state, but I can’t remember which. It is funny that you go to Japan before Vietnam, isn’t it? I hadn’t thought of that. Now I’m wondering what I’d be like if I had a daruma! Would I be like you, or would my mind race with the goal in my mind? 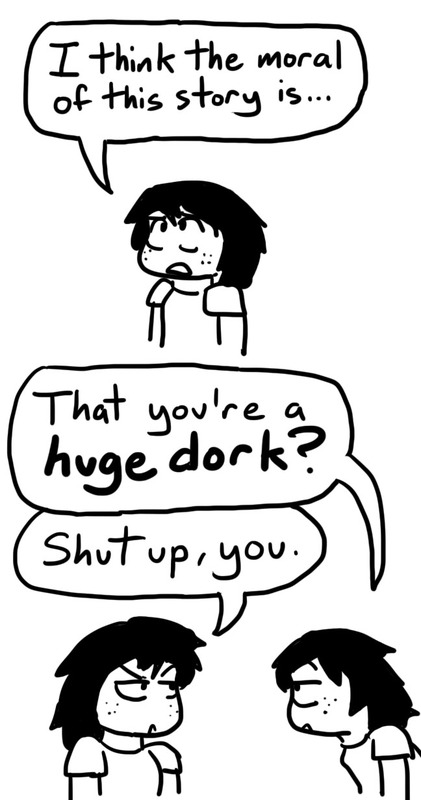 *shrug* Oh well. You went to Hawaii?! I’m mad jealous! How was is? Beautiful black beaches and scenic volcanoes as those brochures always claim? Do you get daruma in Chinatown or something? I’ve never actually seen one in real life. I visited Oahu, so I didn’t get to see the volcanic area of Hawaii, unfortunately. But I did get to see Waikiki Beach and surf out there in a surf school. There were lots of coral that was like rock though, and I cut my knee on one. But it didn’t hurt! So yeah, I loved Hawaii. And we also went to a luau. You got to go surfing!! That’s, like, my dream. SO COOL! 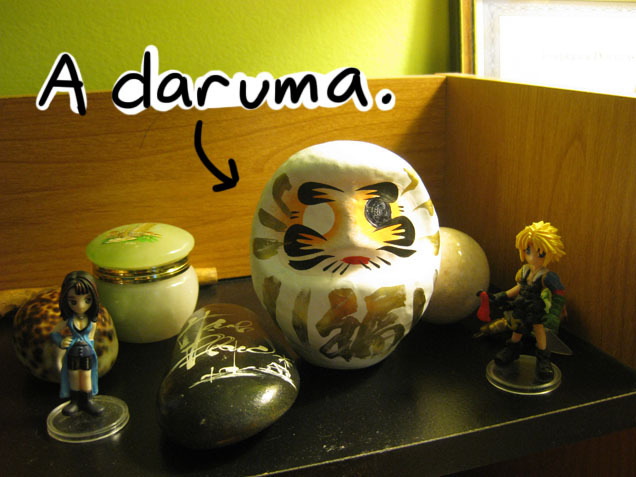 You know, I’m not exactly sure where to buy daruma. I got mine from Mazda Europe, and I know they sell them online. But I haven’t seen one being sold in real life either! Only in Japan, maybe? Did you know the Origin of Daruma is that its a figure based on a Zen Buddhist Monk who was said to have cut off his eye lids so he could stare at a stone wall for several months?